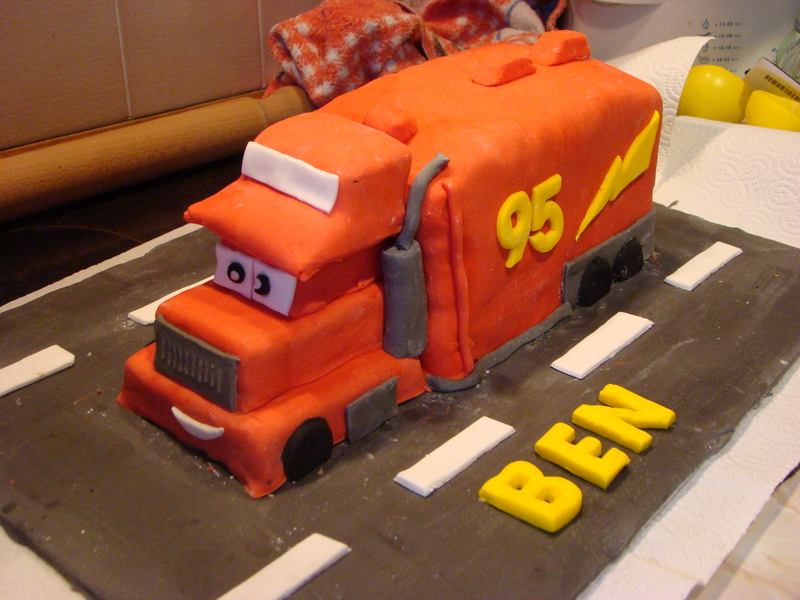 This year when I asked Ben what cake he wanted for his birthday party he changed his mind a few times, but eventually settled on a Mack cake (Lightning McQueen’s transporter truck from the Disney film Cars). The cake is made from 2 x 20cm square marble cakes (200gms flour, sugar, butter and 4 egg sponge recipe). The cab is made from 5 separate pieces; the base, the bonnet, the cab/eyes section and 2 pieces to make up the cap. I iced each of the bottom three pieces individually and placed them on top of one another. The 2 pieces that made up the cap were iced together as one piece and then placed on the top. The exhaust is made from grey icing, rolled into a cylinder and held in place on the cake using a piece of spaghetti as a kind of dowel. The top pipe is a smaller cylinder of icing placed on top. Finally I added piping around the bottom, wheels, a lightning strike and number “95” on the trailer and eyes, mouth, a white front on the cap, and fuel tanks to the cab.